I have a hard time with extravagance – spending more than is absolutely necessary. That is a nice way of saying I am cheap. Jesus’ words about extravagance in worship are conflicting for me. History is littered with examples of the church rubbing its opulence in the faces of the peasants – often by building lavish cathedrals while people starved. I can point to any number of contemporary churches who have built themselves grand edifices, while on the inside they rot from spiritual indifference to a needy community. Yet, beautiful surroundings can be a powerful part of worship. If the places where we gather for corporate worship are beautifully and thoughtfully designed, they can help us draw close to God. Solomon’s Temple was extravagant, and the blueprints came directly from God. The universe itself is extravagant. Why all that vast, empty space, if not to emphasize the awesomeness of its Creator? On the other hand, an ugly, uninviting building not only can impede worship, it also can send a terrible message to its community. In a 2009 Christianity Today article, architect Gary Wang explored the issue of church design – in particular, how 20th-century modernism influenced the building of drab churches. In the modernist view, form follows function. Simplicity is king and ornamental flourishes are wasteful. Some modern architecture is stunning. Think: Frank Lloyd Wright. Most is dreary. Think: Corporate America. Faceless office building after faceless office building. Cubicles. Wang goes on to profile several new church buildings where architecture moves front and center. Each element not only carries aesthetic appeal, but spiritual significance. Turns out, looking like a church, not a multipurpose center or a mall, isn’t such a bad thing in a culture looking for community. So many protestant churches built in the past half-century are just dressed-up sheds. Boxy, pre-fabricated steel construction. No frills. It’s like worshiping God in a warehouse. They look cheap, slapped together and altogether uninviting: multipurpose pole barns with crosses stuck on the side and a cheesy sign out front. Others are huge, featureless concrete or brick buildings. If not for the sign out front, they could be mistaken for a shopping mall, a YMCA, even a prison. Great things may be going on inside, but for a passerby desperately seeking community in his life, these churches look like … well, like impenetrable fortresses. The attractional model of church holds that, basically, if you build it, they will come. I don’t buy that. Not any more. The missional model gets closer to New Testament Christianity, I think: Go to them; don’t wait for them to come to you. I’ve visited two churches that took my breath away. One was St. Patrick’s Cathedral in New York City. Built during and after the Civil War at Fifth and Madison avenues, today it’s a neo-gothic jewel, surrounded and dwarfed by Midtown Manhattan skyscrapers. Almost everything about the cathedral is lavishly ornate, from its towering spires to its massive wooden doors to the hundreds of narrow gothic arches that form the sanctuary. Through my evangelical lens, I thought I’d feel the cathedral was overly extravagant, more about “look at us” than “look at God.” And I suppose there was a bit of that. But as I walked through those doors, my mind immediately refocused from the noise and bustle of Manhattan to hushed reverence toward the majesty of God. I was surrounded by people of assorted races and nationalities, there to worship God in a cathedral setting similar to what Europeans experienced for centuries. Our traditions may have varied, but the intention was the same and God’s spirit was clearly present. The second place was the Chapel of Transfiguration in Grand Teton National Park. Now, one could rightly say that stepping inside any building while in the Grand Tetons is the quickest way to block the view of God all around you. Here, that’s not the case. The one-room, log-cabin Episcopal chapel is dimly lit and rustic. The pews are made of split logs. 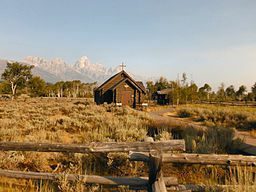 At the altar, behind a simple, wooden cross, is a picture window looking out at the spectacular Teton range. The chapel’s designers understood their simple mission: Don’t put any man-made construct in the way of God’s incredible creation. Those two churches stand at opposite ends of the worship spectrum, but at least for me, both were incredibly effective at pointing to God in their unique environments. Why? They understood their mission and their community. Church buildings are supposed to be about creating an atmosphere that welcomes people and helps them tune in to God. That doesn’t mean going cheap, nor does it necessarily mean going extravagant. It means creating something that connects with your particular community in a way that honors and glorifies God. Beauty is most definitely a part of that equation. It isn’t the only part, nor is it the most important … and there can lie the downside. Both of the churches I just mentioned are known better as tourist attractions than as places or worship. The great cathedrals of Europe are tourist attractions today, too – and little more. Their beauty stops at the ceiling, because their mission has vanished. In the gospels, I think Jesus was complimenting Mary not for the monetary value of the perfume, but the spirit in which she used it: all-out worship and service to God. Where Judas – and I – got hung up on the price tag, Jesus looked at Mary’s heart. The same goes for church buildings today. If they honor and glorify God in a way that is evident to more than just the people inside, then that, too, is a beautiful thing. 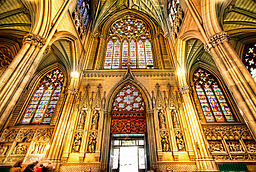 This entry was posted in Culture, Uncategorized and tagged architecture, church, culture, extravagance. Bookmark the permalink. I have similar experience. I have been to vespers at Westminster Cathedral and been awed. I have also been to adobe cathedrals in Mexico and experienced the same sense of awe. The key is whether God is worshiped there. The anointing of Jesus, on the other hand, I see as a singular event in history. We are told that there was no time to give His body the proper preparation immediately after he died because the Sabbath had begun. When the women returned to complete the ritual, it was no longer possible because He had been resurrected. So this pouring of perfume by Mary was his only anointing. I have often wondered what became of the Myrrh given by the Magi, but whatever it’s end it never served its purpose. Unless — can you imagine? — it had somehow come to Mary, maybe as an offering to her poor, devoted household, to help ends meet, but she had saved it for its intended purpose? Regardless, this was the last and only chance to prepare his sacred body for the burial that would last less than 3 days. Perhaps the lost soul seeking salvation will overlook a church hall which is austere, but he cannot overlook any building, even the most ugly, if it holds a gathering of people who have shown him mercy. The good Samaritan was otherwise judged by his abode, but the actions of this single man have made the word mean a selfless, caring person, rather than the original meaning of resident of Samaria, which assumed that any such were misguided worshipers of a twisted religion. At the time of Jesus’ parable, “good Samaritan” seemed an oxymoron, or at least an exception to the rule. Let us show the world we are Christians by our actions rather than our trappings. A pre-fab building can be more spirit-filled than the grandest cathedral. Exquisite beauty can certainly enhance the feeling of awe and reverence once one is inside, but the kingdom of God is made manifest by His people and their actions, not the building in which they gather once a week. Let us draw in unbelievers by inviting the Holy Spirit to dwell within us and make us attractive to all through our love, joy, peace, forbearance, kindness, goodness, faithfulness, gentleness and self-control.